Big trucks should have big side steps, right? That's what we think too. If you're in the market for some beefed up step bars for your truck, we think a set of Aries Alumalite Big Step nerf bars would be a fine option. Built tough to handle the most grueling treatment you can throw at them, these nerfs will serve you well for years to come. Big Step nerf bars feature extremely large 4" aluminum alloy tubes that won't rust along with raised step pads to give you plenty of room stepping in or out of your truck. Good side steps should be rugged and able to handle mud, rocks, and repeated usage day in and day out, and that's exactly what you get with a pair of Alumalite nerf bars. These bars from Aries are finished with a durable textured black powder coat to give you something a little different than the gloss finish most other bars are given. Textured black powder coat also means that this bar have superior corrosion resistance against the elements. Mounting these nerf bars is a snap as well, featuring custom bolt-on brackets that require no drilling. That's good news if you aren't excited by the thought of putting holes in your new truck. You can't go wrong ordering a set of Aries Alumalite Big Step nerf bars. 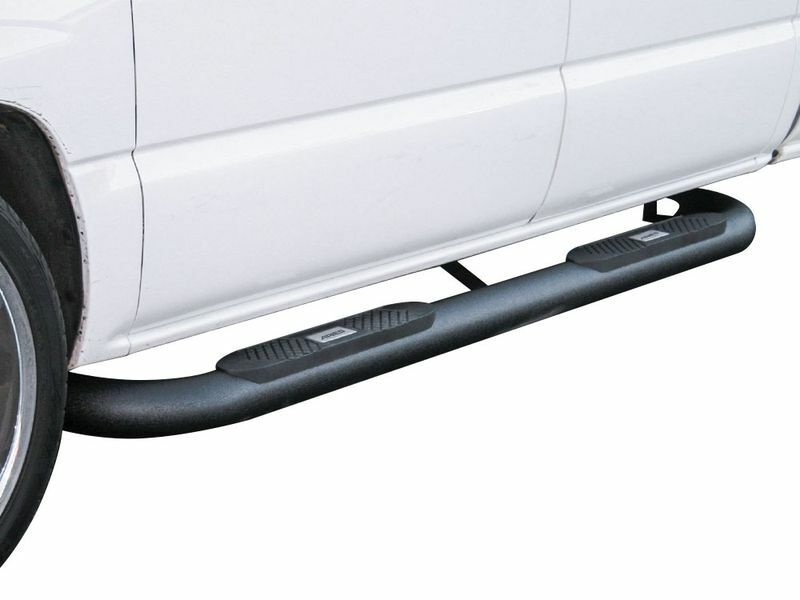 These are the kind of side steps that will deliver the performance and lifespan that demanding pickup owners expect. Aries offers a limited five year warranty against defects in materials or workmanship on their Alumalite big step nerf bars. Custom designed mounting hardware ensures that you will be able to add these nerf bars to your truck with little or no drilling, cutting, or any other modifications. If you need any additional information, please feel free to contact us at your convenience.